To understand Elizabeth’s allegiances, we must first examine her mother, Jacquetta of Luxembourg. At the age of seventeen, Jacquetta was married to the Duke of Bedford, uncle to King Henry VI of England. The marriage was political. Since Jacquetta was related to the Holy Roman Emperor, it was assumed that this marriage would bind England and the Empire. Two years later, the Duke of Bedford died. The Duke’s chamberlain, Richard Woodville, was ordered to bring Jacquetta to Henry’s court. Richard and Jacquetta fell in love and married in secret. Elizabeth was born within a year or two of the marriage. Needless to say, the hasty marriage was scandalous and resulted in a large fine, but once the fine was paid King Henry forgave the pair. About eight years later, the king married another of Jacquetta’s relations (by marriage), Margaret of Anjou. This made Jacquetta a relation to both the king and the queen, putting her family in a powerful position. Therefore, all the Woodville’s, including Elizabeth, were supporters of the Lancasters. But Elizabeth’s love affair and hasty marriage would change their allegiances forever. Upon entering Margaret of Anjou’s court, Elizabeth Woodville quickly became known as the belle of England. She was a fair-faced, heavy-lidded, flaxen-haired beauty. Letters between Richard Neville and Richard of York describe her as the loveliest and most sweet-mannered maid in court. The two men tried unsuccessfully to marry her to a poor knight, but Elizabeth used her fair face to rise. She married the wealthy, yet handsome John Grey. When King Henry went mad, leaving only an infant son for heir, the York cause grew stronger. Clashes between Richard of York and Henry’s wife, Margaret of Anjou, fueled flames between the two lines. Battles raged again, and most in England chose either the white rose of York or the red rose of Lancaster. The Woodville’s remained loyal to the Lancasters. Elizabeth and her mother, Jacquetta served Margaret of Anjou faithfully. Elizabeth’s father and brothers fought bravely against the Yorks. Elizabeth’s husband, John Grey, lost his life under the red rose, dying in the Second Battle of St. Albans. With the help of his cousin, Richard Neville, Earl of Warwick, Edward took the throne. An alliance with France had been made. A marriage between King Edward and a French princess was being negotiated to secure the peace. That marriage never happened. Elizabeth’s sons were denied their inheritance, and when Elizabeth heard the king was hunting near her mother’s castle in Grafton, Elizabeth, with a son in each arm, waited under a tree for Edward to ride by. She dropped to her knees and begged for his mercy. The young king fell for her immediately, but Elizabeth would not give herself lightly. Edward was a known womanizer and Elizabeth denied him. This only made Edward want her more. The two wed in secret in her family’s home on May 1, 1464. Edward seemed reluctant to acknowledge Elizabeth as his wife. She gave birth to their first child only five months after Edward publicly acknowledged her, and it took over a year for her to be crowned. The irony of Edward’s choosing a Lancastrian widow was not lost and never forgotten by those who helped him to the throne. Edward must have been quite besotted with her, knowing the marriage would not only upset the truce with France, but also his English allies. Perhaps no one was more disappointed by this union than Richard Neville, who worked diligently to secure the alliance with France. Evidence shows that Neville tried to get along with the Woodville’s at first even though it must have been frustrating to see Edward give up a strong French alliance so he could marry a commoner. Adding injury to insult, Elizabeth hastily married her brood of siblings into the wealthiest and most influential English families. Edward certainly treated Neville well, too, rewarding his loyalties with land and titles, but it never was quite enough for Neville. Eventually, Neville rebelled the Woodville influence over the king, taking up his sword. He aligned with Edward’s younger brother, George, Duke of Clarence, waging war against the king several times. At one point, Neville even sided with his former enemy, Margaret of Anjou, marrying his daughter to her son. Neville had Edward on the run more than once forcing Elizabeth to spend time hiding with her children in sanctuary. All in all, Elizabeth and Edward’s marriage was a fruitful one, producing ten children. Elizabeth rose quite high, from a low-ranking noble to the Queen of England. Richard III usurped his young nephew’s throne, holding him prisoner while claiming to plan a coronation for the boy. Elizabeth’s son and brother, who served as guardians for the prince were executed. Elizabeth took sanctuary with her children. Richard demanded her other son be brought to court. Whether Elizabeth sent him or a decoy is not known. No one knows for sure what happened to the two princes, but two bodies were found in the Tower of London in 1674. 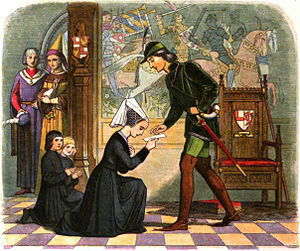 Elizabeth’s marriage to Edward was deemed illegitimate during Richard III’s reign. Elizabeth and Margaret Beaufort arranged a marriage contract between their children: Elizabeth of York and Henry Tudor. Upon the death of Richard III, Elizabeth was restored to the position of a dowager queen. The marriage between Elizabeth and Henry united the Yorks and Lancaster under the white and red Tudor rose and ended the thirty year War of the Roses. This entry was posted in Historical Fiction and tagged Edward IV, Elizabeth Woodville, England, Henry VI, Lancasters, Richard Woodville, The Lady Rivers, The War of the Roses, The White Queen, York on April 17, 2013 by Andrea Cefalo.